Meaty clams flavored with bacon, cream, and a secret blend of herbs and spices. 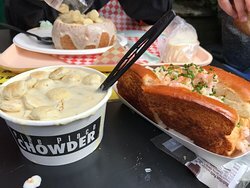 Voted "Nation's Best" at Rhode Island's Great Chowder Cook-Off. Authentic Pacific Northwest flavors, with nova smoked salmon, capers, and cream cheese. 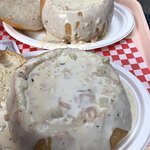 A Seattle favorite! Perfectly balanced herb-infused tomato broth, slow-cooked with onions and celery, loaded with tender clams. Chicken, prepared on the grill and mixed with fresh corn and a vegetable medley, aromatic with spicy southwestern flavors, in a creamy broth. Customer’s Choice of four 5 oz. 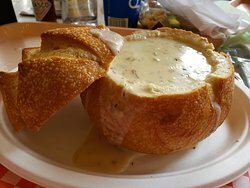 cups of any chowder. 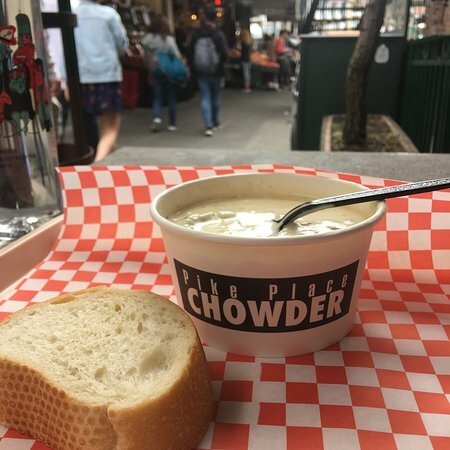 All Chowders served with our fresh-from-the-oven sourdough bread, and butter. A seafood extravaganza of Pacific cod, Northwest salmon, Oregon bay shrimp, and crab, seasoned with fresh basil and simmered in a creamy, tomato-based broth. Voted “Nation’s Best” at Rhode Island’s Great Chowder Cook Off. Velvety chowder prepared with the freshest vegetables simmered in coconut milk, enhanced with the zesty, sunshine flavor of lime juice. Chef’s choice of ingredients and flavors especially fresh and delicious, every day. May include halibut, scallops, shrimp, oysters, crab, or salmon. 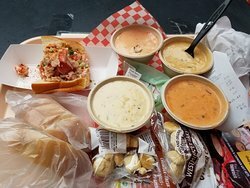 Your choice of chowder 8 oz., side salad, and a bottomless soft drink. 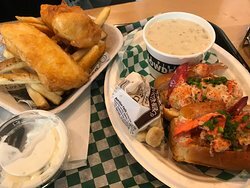 Your choice of chowder8 oz., with a half-sandwich of our original Dungeness Crab Roll, and a bottomless soft drink. 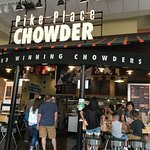 Your choice of chowder 8 oz. with a half-sandwich choice of curried chicken, alder smoked salmon, Oregon Bay shrimp, and a bottomless soft drink. Everybody’s Favorite! Fresh crab, mayo, celery, lemon juice, and our secret seasonings. Delicate salmon, smoked to perfection, and tossed with roasted corn salsa. Mouth-watering bay shrimp marinated in lime juice, tossed with tomato, onion, celery, seasoned with a dash of cumin and bright cilantro. Grilled chicken breast, diced and enhanced with our creamy curry dressing, tossed with celery, almonds, and raisins. We offer morning-fresh greens, served with a variety of dressings, and the great taste of sourdough bread and butter. Market-fresh assortment of greens and vegetables, with your choice of dressing. America’s Favorite! With crispy romaine, toasted croutons, grated parmesan cheese, and our traditional savory dressing. Healthy, deep-green spinach filled with bacon, mushrooms, mozzarella, sliced egg, and crunchy toasted almonds, served with tangy vinaigrette dressing. Straight from the ocean, Oregon Bay shrimp with olives, tomato, sliced egg, and cucumber, served over fresh, mixed greens, and served with creamy 1000 Island dressing. Il y a du monde, très peu de place, prenez votre mal en patience... ça en vaut la peine !!! 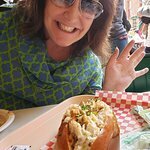 Les Lobsters Rolls sont délicieux. Restaurant au pouce excellent qui a une très bonne réputation pour sa qualité de nourriture et avec un bon rapport qualité prix. 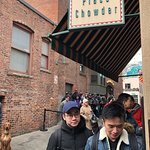 Une file attente rapide pour déguster de bonnes soupes, du crabe , du lobster.... venir absolument les yeux fermés. 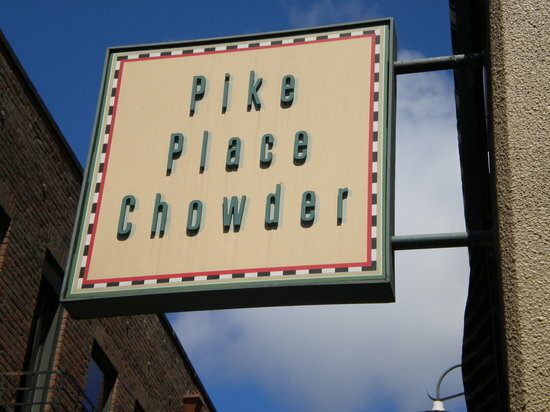 Best chowders in the world! De la très bonne chaudrée! Oui, il faut être prêt à faire la file, et oui, on se bouscule un peu dans cet endroit exigu, mais ça en vaut le coup... la chaudrée est à se rouler par terre! Servie dans un bol en pain, on se régale sans retenue. Une soupe de palourdes savoureuses bien servie... simplement un regal! !du monde et lieu tres convivial!!! Nous avons testé celui du centre commercial vers la 7e ave et Pike. Au 4e étage. Tres bon et assez copieux. 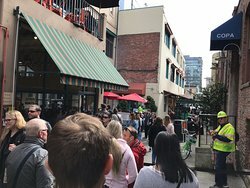 peu de monde par rapport au Pike Market. Les fish and chip saumon sont tb aussi. À recommander. 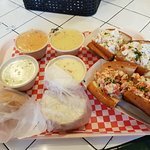 Excellente Clam Chowder et Lobster roll! A l heure de dîner il peut y avoir une bonne ligne d attente. Tenter d y aller vers 14h30 L attente sera moins longue ! 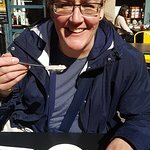 Trop bon cette petite soupe aux fruits de mer! Bien cremée et avec du pain ca vous réchauffe par un jour de pluie... Typique et délicieux, je recommande! Sosio's Fruit and Produce, Inc.
Obtenez des réponses rapides du personnel et personnes ayant visité le Pike Place Chowder.